My radio reception is not terrible ie I can get Kiss FM, Radio 1 and Heart OK in London (NW2 postcode). Other stations such as Capital Xtra (96.9 & 107.1) are very fuzzy and faded, despite me being in Zone 2 of London, North West. On my old car (Peugeot) Capital Xtra sounded perfect in the same location, and my flatmates audi is crystal clear. I also sometimes find Capital breaks up where I have never had issues previously. The car is a 65 plate Fiat 500L, only 13k miles... 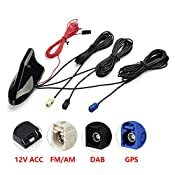 I have tried to change the antenna with a Fiat 500 one from the Fiat website, have removed the radio and checked the aerial is connected in the back, have removed the felt from the roof inside and looked at the antenna connection, the wire seems to go into the antenna on the roof just fine. I have tried removing my USB charger from the cigarette lighter with no difference. I have upgraded to the latest uconnect version (v13 I believe it is). 1) Do others have similar issues? 2) Does the 500L have a booster for FM radio integrated? Where is this - could it be faulty? 3) Any suggestions for fixing? Last edited by potato92; 18-03-2019 at 22:43. Just looks like a simple cable, no booster. Is it worth me buying a booster to see if it helps? Any ideas how it would get power? There was no obvious 12v power at the back of the unconnect unit, as has been the case on other vehicles. I'd say you're probably looking at an issue with the cabling itself. Easiest thing to do would be to get hold of an antenna and cable from another vehicle (scrap yard for example), and plug them in to the stereo. You wouldn't need to pull all the old cabling out or routing the new stuff in at this stage, just plug it in and test to see if it improves. If it doesn't, it could be the headunit itself at fault. Thank you really appreciate that, it is weird as Radio 1, and Heart are Crystal Clear. If I take the aerial off the top of the vehicle I get no signal and it all stops, place it back on and the signal comes back. That to me sort of indicates the cable is working, although I could be wrong. I will try to get my hands on a new aerial + cable to test. Bought one which claims to be "genuine" on ebay. Will update. What I did notice when I took off the cover for the roof, the aerial runs alongside all of the wiring for the lights at the back of the car, down the side by the windows. It is literally surrounded by a bundle of cables... I can only imagine the interference etc this adds? It then appears to come up from behind the dash and again seems to be running with the wiring behind the console which seems to be a whole bundle again. Is this standard? Last edited by potato92; 4 Weeks Ago at 18:31.
very impressed so far even connected via FM the sound is better than the radio. I must add my radio received the stations just fine I just prefer the wider choice of DAB. I took the original 500L antenna off and inspected it. I tried putting the original antenna right into the car radio unit and the service was just as bad. To update the loop, purchased an aerial on Amazon, fitted it and removed the old kit. Reception is crystal clear on every station other than Capital XTRA, which is also much improved with just the odd once in a while fuzz/dip in reception. Still a HUGE improvement. I also picked up Kiss today on the M3 in an area I couldn't get it in every vehicle I've ever owned which was nice. I fitted this, went for this style to make using the carwash etc easier. Price wise bit of an overkill but the reviews spoke for themselves, and I was struggling to find anything highly rated. Last edited by potato92; 4 Weeks Ago at 18:55. Does the aerial alone lets you get DAB? Would it work on a skank head unit like in my Stilo, or do you need a digital head unit as well? I have the odd problem losing stations.. it's not too severe but if it's just a new aerial and a sneaky raid of the baby's birthday money, it might be a goer..
You need a DAB headunit too. Final update, as I like to keep things OEM I had ordered a fiat genuine base roof mount and aerial, but it was coming in from Poland. Fiat 500 Part 50540987. Signal is brilliant, even better than the aerial above, so the original unit must have been faulty. On observation the original unit had a booster in the base roof mount, and this was slightly damp / wet which I am sure was causing troubles. Validated with fiat, the radio headunit sends a signal to the aerial amplifier via the standard aerial cable. Over the past nine weeks our car ( Fiat 500L Trekking 2016 ) now has a intermittent DAB lose of signal. Dealer has upgraded the software. After which the fault is still Happening. Their next move was to change the Aerial Base Unit. This was done on the 4th April. 5th April the signal was lost 10 times in four and a half miles. I am aware of a Youtube clip where they say and show the removal of the radio to reach the Blue DAB connector at the rear of the Radio Unit. Now our car is booked in for the 16th April where they are giving me a courtesy car in hope that they find and trace the fault. Which happens mainly when you have the car heater on. So I am thinking the Aerial lead is faulty and flexing when the heater is on. I would assume the aerial coax shall go from the radio to a Multi Plug before heading to the roof aerial. Anyone else having similar problems.